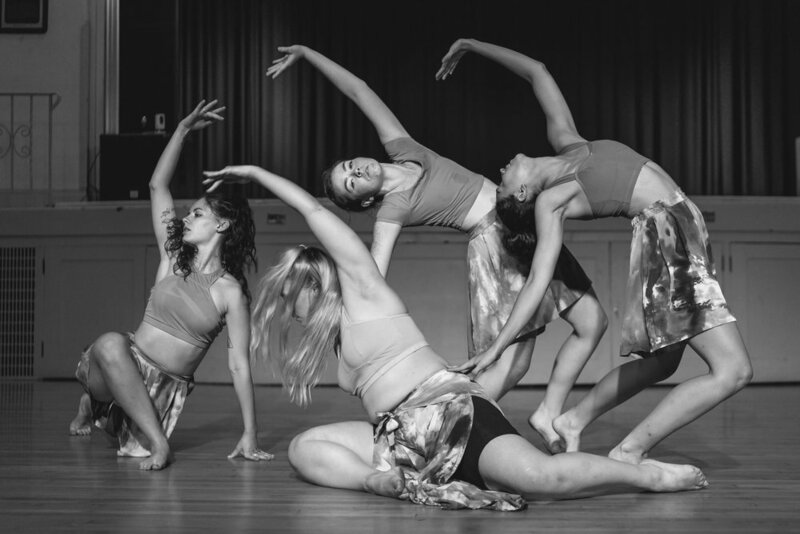 Myriad Dance Company presented “Lights” at The Downtown Artist Collective on Sunday night. A project spearheaded by co-director Temria Airmet, Myriad donated all proceeds from the show to the Utah branch of Volunteers of America; the six performers and five musicians donated their time to the project as well. The Downtown Artist Collective is a small storefront on 100 South that offers handmade wares by local artists and artisans. For the show, store displays were pushed against the walls to make space for dancing; similar to other recent shows, such as those at Main Street gallery Art 270, the “stage” itself was fairly small and the audience sat right up to its edge. “Lights” dealt - sometimes literally, sometimes indirectly - with the social and political climate that has come to a head in 2016, and I felt Myriad’s intent and hope from the moment I walked into the space. It was packed, with hardly a seat left in the house, but I was able to squeeze myself to the front and secure a (very awesome) seat on the floor. I noted my negotiation in and amongst a sea of people as a boon in a world where understanding and acceptance seem to occasionally take the back burner; “Lights” was not only Myriad Dance Company’s reaction to 2016, but a call to action. The audience and I experienced physical closeness during our viewing of “Lights”, and were (gently) forced to be mindful and accommodating of both the space we ourselves take up and that which others take up around us - an idea whose easy extrapolation is how we coexist in the larger world with those both like and different than ourselves. The space featured a hodgepodge of lamps, occasionally turned on and off by the performers, that created a general tone of intimacy; perhaps, we were not at a performance but instead sharing thoughts and conversation in someone’s living room. Additionally, live musicians both accompanied and were interspersed, salon-like, between the dancing numbers: a guitarist, a husky-voiced folk singer, a singing guitarist, a dancer-turned-vocalist, and my favorite musical performance of the evening, pianist Joseph Chang. The dances in “Lights” featured different groupings of the six performers, including creator Airmet, and since no choreographic credits were mentioned in the program, I assume most were made collaboratively. Two solos by Airmet bookended the show (except for a group finale) and were the most potent, searching works of the evening. Airmet always performs with unwavering conviction, and these solos were no exception. They featured poetry spoken, and presumably written, by Airmet and complemented her often-gestural and alternately soft and hard-hitting movement. The choreography could have been considered simple if unaccompanied, but in tandem with the words, illuminated Airmet’s myriad (no pun intended) strengths as transporting performer, imaginative writer, and thoughtful human. Throughout other sections, Airmet looked like she could be reciting poetry in her head as she danced - so specific are her expressions as they relate to her movements. Intent manifested with varying degrees of maturity in other members of the group, but a general sense of personal investment in each dance was always clear. Performer Ashley Creek exhibited compelling clarity, hers such that it travelled through and articulated her entire spine. Kendall Fischer radiated honesty and warmth in her sweet, short vignette with another dancer. Seeing the performers’ unique identities onstage was a reminder that we all possess complex inner realms, though not all do or are able to express their hopes and concerns as openly as through performance. For me, “Lights” was a shared experience in vulnerability, empathy, and inclusivity, and a call to remember those things in our daily interactions. Myriad implemented a wide range of choreographic choices given the limited space: tour jetes, slides to the floor, battements, and hitch-kicks, sometimes in groups of four, five, or even the whole company. I will posit that the dances, though earnest, could gain from indulging the expansiveness the choreography seemed to crave with either a larger space (though I recognize usable and affordable space is hard to come by, even in SLC) or by allowing more dances to have fewer participants; solos and duets usually offered the most breath and fullness. The intimate setting at The Downtown Artist Collective uniquely drew focus onto individual performative arcs (differing, perhaps, from Myriad’s previous “Doors”, which I also reviewed), but the underlying concept for each dance, regardless of number of dancers, was group unity. I felt this net of unity cast not just over the performers, but also over members of the audience as we negotiated knees and coats. Sometimes the net was cast directly from performer to audience, such as when Alyx Pitkin began to fall forward, only to then be caught by the group, suspended over the first row of audience members. I, too, felt kinesthetically involved, when I experienced wind from a leap across my face on several occasions. Casual intimacy was a successful thread throughout the show. At one point, dancer Sierra Stauffer leaned against the piano, played again here by Chang, to sing; she oscillated between a contemplative, inward focus and sharing inviting smiles with audience members. Less effective were moments when the dancers seemed to perform for an audience imagined farther away than actually the case. In my viewing of “Lights”, it was important that the performers acknowledge our proximity, a uniting factor over the course of the evening. In her second solo, toward the show’s end, Airmet spoke, “My voice got quiet because the truth was hard”; through “Lights”, she has found a voice, both for herself and Myriad, in movement, music and performance. For the group’s finale, Airmet, who often invokes music by Kanye West in her work, used his 2016 song “Ultralight Beam”; it was her most effective invocation of West I have seen yet. The group found stillness in a tableau at the song’s conclusion, while still breathing heavily (“Father, this prayer is for everyone that feels they’re not good enough”), then, blinking their hands like twinkling lights, reached skyward. Amy Falls is loveDANCEmore’s program coordinator and a regular contributor to the blog.